Have you been “googling” for the latest information on the Braun Clean and Renew System and the Braun line of shavers? Fantastic, because you’ve come to the right place. My name is Parker, and I have built this website to help men and women learn all there is to know about Braun shavers (either for buying for yourself or when looking for the right shaver as a gift). Braun shavers are consistently number 1 bestsellers on online shopping sites like Amazon and there’s a good reason why. Whether you are already a fan of electric shavers or are just starting out, picking the right shaver for you is not an easy task. …but now you want to know about a specific model. Well, the home page of my blog focuses on their creme dela creme Braun Clean & Renew System — because quite frankly — no other shaving system does what this model does. So just keep reading this page to find out what ALL the fuss is about….or to be taken to specific Braun models. If you are after Braun shaver parts like shaver head replacements, battery replacements, etc. then just click on the links on the right to be taken directly to those. Any questions at all, please feel free to leave your comments. Oh…and in case you’re wondering why a woman has created a resource about men’s shavers….well I like a man with a close shave (who needs stubble rash, right). So I think I’m perfectly qualified…. What is The Clean and Renew System by Braun? How Does The Cleaning System Work? What Can Shaver’s be Used With The Clean And Renew System? What Comes With The Braun Series 7-790cc Pulsonic Shaver System? How do the Braun Series 7 models differ? What Comes With The Braun Series 7-760cc Pulsonic Shaver System? What Comes With The Braun Series 5 550cc Pulsonic Shaver System? Shaving is a task that most men have to partake in daily. However, we live in a high-tech world where there isn’t time to drag out the traditional razor and shaving cream. There is a better solution to that fresh, clean shave that men love. It’s called the Braun Clean and Renew Shaving System. The Braun cleaning system uses the most advanced technology to make shaving a breeze. With a touch of a button, this system will clean, charge and lubricate your shaver. The blade of your shaver will be kept in the very best condition. This system uses an alcohol-based solution that will wash away stubble, and enhance the performance of the shaver every time you use it. Giving your shaver a regular cleaning will leave you feeling fresh because this system promotes optimal hygiene. The Braun Syncro Shaver System Clean & Renew Refills are available at popular retailers in your area, as well as online distributors. Cleaning begins automatically with the touch of a button and can be done in as little as 25 seconds. This is one of the quick clean methods that Braun offers their customers when using their clean and renew system. Once the cleaning cycle begins, it uses a specialized cleaning solution that will optimize the cutting effect of the shaver by renewing the blades with a fresh lubricant. This will keep the blades in peak condition. The cleaning formula will leave behind a fresh scent of lemon, which will leave your face feeling clean. While you may be thinking, “I bet I have to put in a new cleaning cartridge every day,” that isn’t the case at all…Each cleaning cartridge will give you a full month of clean shaving. Braun electric razors have been tested, and with proper maintenance, they have been designed to last six years. However, the clean and renew system will extend the life of your Braun razors and their performance. Men couldn’t be more pleased with the cleaning system that Braun has provided them. This system has given them a better shave that leaves them feeling fresh and renewed. Plus, it prolongs the lifetime of the shaver. Men are consistently saying that using the Braun Clean and Renew system feels like a brand new shaver every day. Even men who have used other brands for 30 years or more are happy they made the switch to the Braun Clean and Renew method of shaving. A consistent comment is it gives a smooth, close shave which is not usually seen with an electric shaver. 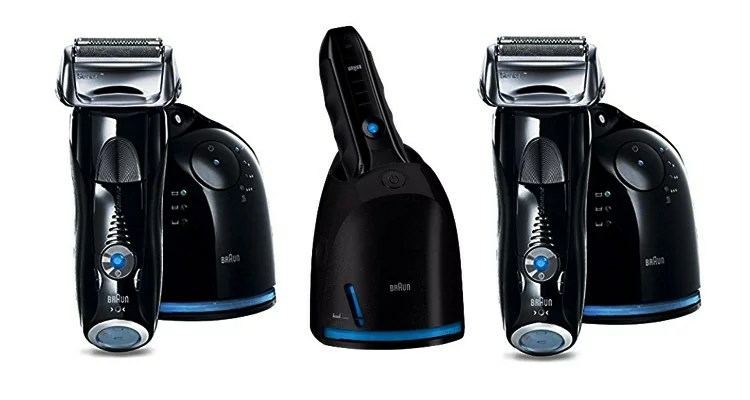 Another comment that is frequently made is that men who have very sensitive skin are thrilled with the way their skin feels after the close, yet gentle shave with these Braun shavers. Oh, before I forget…another great feature is the fact that it has a built-in beard trimmer. Here are three recommendations that Braun gives to get the most out of your shave. You should finish shaving before washing your face. Make sure the razor is held at a 90-degree angle to your skin. Pull the skin and go against the direction of your facial hair growth. What are the Best Braun shavers to use with the Braun Clean and Renew system? This system uses shavers from series 3, 5 and 7. There is a wide variety of shavers within these series that will fit all the needs a man has when it comes to properly grooming facial hair. The base of the system will vary according to what series it is from. However, all the series cleaning systems work and offer the same features. These features include cleaning, charging, lubricating, drying, and specially formulated cleaner. Men love the fact that there are so many options when it comes to what Braun shaver can be used with this system. Plus, the shavers are sold together as a set with the clean and renew system. So, you don’t have to worry about searching for the right system to go with your shaver. If you happen to buy your shaver separately, you also have the option to buy just the cleaning base. Either way, you go, Braun has made it easy for you to gain the benefits of their revolutionary cleaning system. I found this video online which will help demonstrate some of the features that I have mentioned in my review. The Braun Series 7 clean and renew shaver is the cream of the crop. The 790cc model is the most advanced shaver offered by Braun and is designed to give the ultimate grooming experience. Braun designed this razor to use Pulsonic Technology, which produces 10,000 micro vibrations to cut more hair with each stroke. That means you will spend less time standing in front of the mirror trimming your facial hair, and more time doing the things that you enjoy. This shaver offers three different personalized modes and a powerful motor that will provide its users with a clean cut shave. Pulsonic Technology- produces 10,000 micro vibrations to cut more hair with each stroke. Active Lift- can lift and cut flat-lying hair. Even the stubborn ones on your neck. OptiFoil- this is a one of a kind design, which gives the shaver the ability to cut more hair and offers a closer cut. Precision Long Hair Trimmer- constructed to trim sideburns, mustache, and beard with perfect precision. Triple Action Cutting- three settings that allow you to cut any size hair including long or short. Auto Contour Adaptive Shaving Head- forms to the shape of your face. The curves around your jaw line and under the chin are no problem for this advanced razor. 100% Waterproof and Fully Washable- shaver can be rinsed quickly under water because the body is fully sealed. LCD Display- gives you a visual update of the status of the system, including charging, battery life and hygiene status. So, Braun has given this shaver the ability to save three modes to easily care for your skin type. These include Extra Sensitive, Normal, and Intensive modes. The Cleaning System- automatically cleans charges, lubricates and dries your shaver at the touch of a button. The 720s to 760cc series contains all the features and benefits of the Braun Clean and Renew system. All these shavers can be automatically cleaned, lubricated and dried with the system. The 790cc model is the leading shaver in this series. It has all the same benefits as the 760cc, but Braun gave it a fast cleaning option. The display is also more advanced in this model. The 790cc can give you a status update on charging, battery life and cleaning status. Braun has worked hard to give their customers a product that would provide them with the best shave they have ever had. The Braun Series 7-790cc Pulsonic Shaver System uses the most advanced technologies to ensure a close shave, while the cleaning system will leave you refreshed. The Braun Series 7-760cc Pulsonic Shaver uses 10,000 micro vibrations to cut more hair with every swipe that is made. It has three convenient, personalized modes that will help to make your shaving experience quick and easy. This shaver also has a powerful linear motor, which will provide a thorough and comfortable shave. The Braun 760cc offers the Braun Clean and Renew system which provides you the best hygiene possible. This system automatically cleans, charges lubricates, and dries your shaver at the touch of a button. Active Lift- has the ability to lift and cut flat-lying hair. Even the stubborn ones on your neck. 5-Stage LED Display- gives you a visual view of the status of the system, including charging, battery life and hygiene status. 3 Personalization Modes- no two faces are alike. Braun has given this shaver three modes to easily care for your skin type. These include Extra Sensitive, Normal, and Intensive modes. The Cleaning System- automatically cleans, charges, lubricates and drys your shaver at the touch of a button. Shaving is an essential part of a man’s life. Sometimes it is the most problematic areas which make men want to stop shaving all together, and grow out their facial hair. The Braun series 5-500cc shaver uses the advanced technology of ActiveLife, OptiFoil, and a Contour-Adaptive Shaving Head to make shaving problematic areas a breeze. Braun has designed the 500cc shaver to give a man the kind of grooming experience he has always wanted, but could never get with other shavers. Active Lift- has the ability to lift and cut flat lying hair. Even the stubborn ones on your neck. Contour Adaptive Shaving Head- forms to the shape of your face. The curves around your jaw line and under the chin are no problem for this advanced razor. 2-Stage LED Display- gives you a visual update of charging and battery status. Rechargeable Battery- designed with a Li-Ion battery that is powerful, and does not experience any memory defect after repeated charging. There are a variety of refill packs available on the market for the Braun Clean and Renew System. A cartridge is rated to last for one month if used after every shave. These refill cartridges will leave you feeling fresh, and provide you with the best hygiene possible. Packages of the refills are offered in 2,4,6,10 and 12. However, the most preferred pack is The Braun Clean & Renew Cartridge Refills, Frustration Free 4 Count. This tends to be just the right amount of refills for the man who does not want to run out but does not want to spend a bunch of money at one time to buy a big bulk. The 5000+ reviews and 5-star ratings for the Braun Clean and Renew System really speak for themselves. Braun is the market leader in shaving technology, and it’s easy to see why. If you are a man who hates to spend countless hours grooming and cleaning your shaver, then the Braun Clean and Renew System is for you. If you want a smooth, close shave that’s also gentle on the skin, then this will work wonders for you. If you want to feel like you are using a new shaver every time you shave then the Braun Clean and Renew is for you. As noted, there are a variety of shavers that are compatible with Braun Clean And Renew system. Those problematic areas are no longer an issue when you have a series 3, 5 or 7 Braun shaver on your side. Each series offers a few new features that the last series did not have, so series 7 tends to be the most advanced shavers in the Braun line. The advanced cleaning system will clean, charge, dry and lubricate the shaver with a touch of a button. There are a variety of refills available to suit your buying needs. Braun knows what men want, and that is why they have designed this unique cleaning system to work with their already fabulous line of shavers.